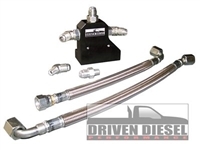 Home > Ford > Ford Powerstroke 1999-2003 7.3L > Fuel System & Related > Fuel System Plumbing/Misc. This custom regulator spring will run a 125G FASS Titanium Series pump at 75psi. This pressure is required in Ford 7.3L and 6.0L applications, in order for the engine mounted fuel pressure regulator to be able to properly manage the overall fuel system pressure.